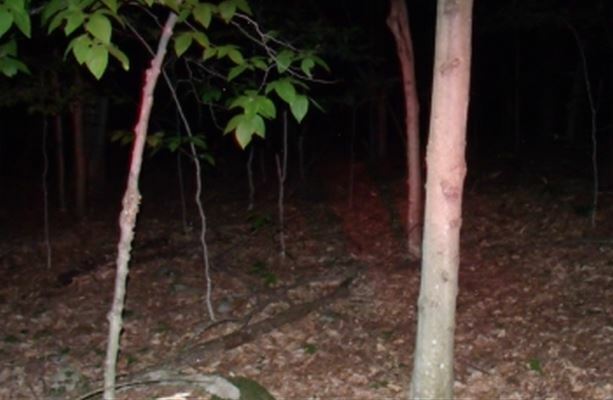 May 2012 - “The NatGeo Expedition"
5-5.5 ft tall colored light brown seen running across trail head One witness. Large dark colored one spotted observing camp from a distance of about 200 feet away. Two witnesses. Something bangs very loudly on one of the teams vehicles. Chattering (chimp-like) heard at approximately via parabolic dish. One of team while exploring gets grunted at. He is unable to see what did the grunt despite having fair amount of field of vision. 9 inch track found in the vicinity where 5-5.5 ft creature observed on night one. Evidence of possible gifting occurred as well as the discovery of a birch log being placed directly behind one of the team vehicles. This particular expedition was the first time we experienced what may be considered as gifting. It was a wet and rainy expedition and when we arrived at camp we went about collecting firewood for some time. During our September night surveillance, the former Squatchdetective.com Field Research Team had encountered what appeared to be probes by at least two creatures approaching from our east and north east. Some of the activity included hearing wood knocks, vocalizations and having rocks thrown at team members. At one point, we probed forward ourselves and could hear foot falls down hill from us. Steve Kulls, decided to take a few pictures aimed in the areas of these footfalls. The pictures to the right exhibit eye-shine, actually walking closer to the team. Mind you these pictures were taken downhill and appear to represent something around 7 - 7.5 feet tall. The first picture (top) the eye-shine is red in color and is much more difficult to see than in the second. The second picture shows a larger, brighter and closer eye-shine than in the first picture. 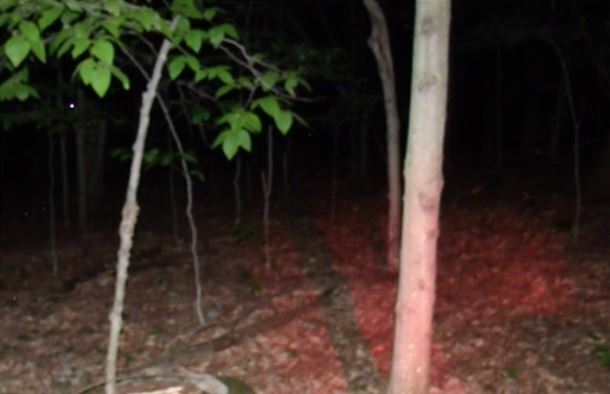 The red light on the ground in the second picture is from our former videographer Mike.